This quirky book grew on me. Martin, an OCD coffee barista (he works for the health insurance) spends the rest of his time breaking into people's homes and taking things they will never miss. His system is outrageous and totally believable. I found him fascinating and ultimately likeable. "The story of an obsessive-compulsive housebreaker whose every waking moment is jam-packed with finicky clockwork ritual--the kind of intense micro-planning that might have made even Napoleon back off...Matthew Dicks has created an unforgettable character that will have you torn between wanting to throttle him--or adopt him." A career criminal with OCD tendencies and a savant-like genius for bringing order to his crime scenes, Martin considers himself one of the best. After all, he’s been able to steal from the same people for years on end—virtually undetected. Of course, this could also be because of his unique business model—taking only items that will go unnoticed by the homeowner. After all, who would notice a missing roll of toilet paper here, a half-used bottle of maple syrup there, or even a rarely used piece of china buried deep within a dusty cabinet? Even though he's never met these homeowners, spending hours in their houses, looking through their photo albums and reading their journals, he feels like he knows them. So Martin decides to meddle more in their lives—playing the part of a rather odd guardian angel—even though it means breaking many of his neurotic rules. In this hilarious, suspenseful and often profound novel about a man used to planning every second of his life, Martin comes to realize that life is much better lived on the edge (at least some of the time). MATTHEW DICKS is a writer and elementary school teacher. His articles have been published in the Hartford Courant, he has been a featured author at the Books on the Nightstand retreat, and he is a Moth StorySLAM champion. 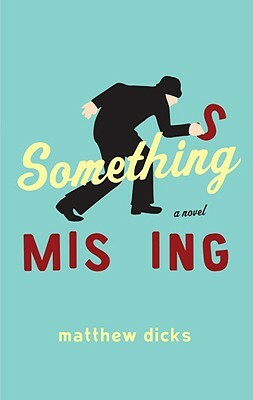 He is the author of three other novels, including Unexpectedly Milo, The Perfect Comeback of Caroline Jacobs, Memoirs of an Imaginary Friend, an international bestseller. His novels have been translated into more than 25 languages. He lives in Newington, Connecticut, with his wife, Elysha, and their two children.